Last week Yahoo! writer Michael Silver wrote an illuminating piece about the roadblocks encountered by black offensive assistants in becoming NFL head coaches. Silver points out that, despite progress in integrating assistant coaching jobs traditionally dominated by whites, the “offensive guru” pool – which consists of a majority of white QB coaches and offensive coordinators and is a direct pipeline to head coaching jobs – is still almost exclusively white. "The reason why there aren't a lot of (black) guys calling plays is that you have to have people ascending to quarterbacks coach and jobs that lead to coordinator positions. And that's simply not happening." Baltimore Ravens Jim Caldwell is the lone brother currently calling plays for an offense in the NFL, and he just got that position a few weeks ago after Cam Cameron was canned. Caldwell has never called plays before, but he’s been an NFL QB coach and winning head coach. Caldwell’s “black puck on white ice” existence is even more pathetic than the mere five black NFL head coaches in 2012. It’s another quiet failure for racial equity and diversity in American pro sports. Currently, two brothers, the Houston Texans' Karl Dorrell and the Minnesota Vikings' Craig Johnson, are QB coaches. These low numbers don’t reflect a plentiful pool of future black NFL offensive coordinator candidates. Craig Johnson is one of just two black QB coaches in the NFL, a limited pipeline to becoming a play-caller. We thought we’d take a look at how the 2012 play-callers and OCs got to that position. We found that, while QB coach is the usual prerequisite job for play-callers, NFL OCs have risen to the position in myriad ways by coaching different positions at varying levels. Different factors play into the journey. Overall, 23 of the 32 NFL Play-Callers this season were QB coaches at the college or pro level. Seven of the 16 AFC play-callers were never actual QB coaches: Curtis Modkin, Mike Sherman, Tony Sparano, Jay Gruden, Todd Haley, Rick Dennison, and Hal Hunter. Haley coached wide receivers, but he also “coached QBs” as “passing game coordinator” in Dallas, before becoming Arizona OC in 07. The rest – Josh McDaniel, Jim Caldwell, Brad Childress, Bruce Arians, Chris Palmer/Dowell Loggains, Mike McCoy, Bill Daboll, Greg Knapp, and Al Saunders were all college or pro QB coaches before becoming NFL OCs. Saunders was an OC and QB coach in the college ranks, but a head coach and wide receivers coach in the NFL before becoming an OC. Bob Bratkowski, Mike Sherman, Tony Sparano and Hal Hunter were OCs at colleges but not QB coaches, before becoming OCs in NFL. Bratkowski didn’t get his first NFL QB coaching job (2011 with Atlanta) until after he was already an OC with the Bengals from 2001-2010. Sherman got his first OC job in ‘06 but he was a college OC before that and a Packers tight ends coach. Gruden was OC/HC and GM in the Arena League before joining his brother Jon’s Bucs staff as an Offensive Assistant. He worked with QBs, but was not the QB coach. Dennison was an offensive assistant, special teams coach and offensive line coach before becoming an OC. Fourteen of the 16 NFC coaches were QB coaches at the college or pro level before they became NFL play-callers. Mike Tice never coached QBs. He was tight ends, OL coach and a head coach. Rob Chudzinksi started as a tight ends coach and OC in college, before becoming OC of Cleveland in ‘07-‘08. Atlanta’s Dirk Koetter started at the HS level, then worked as OC and HC in college. He didn’t get a QB coaching gig until it came with the responsibility of his OC gig with the Jags. Age is a factor sometimes. Just like a popular artist, hot coaching prospects have to capitalize on their brief windows of opportunity. They can quickly go from today’s main course to last week’s lunch in the NFL. Silver lists Falcons wide receivers coach Terrie Robiskie as an example of a veteran coach that has been done dirty by the system. Robiskie has been an OC with the Raiders and the Browns. He also has head coaching experience. Some feel it’s unfathomable that Robiskie can’t get another OC – even head coaching – gig, but it could simply be that teams feel Robiskie, 58, is past his prime as an effective, innovative play-caller. Just five of the 32 NFL play-callers are born before 1955: Sherman (1954), Gilbride (1951), Clements (1953), Arians (1952) and Saunders (1947). Terry Robiskie has been a long-time offensive coach in the NFL without being given a chance to call plays. Relationships can make or break an aspiring NFL coach too. The social network situation has to be right. Some NFL OCs were college QBs, like Clements (Notre Dame ’72-’74), or sons of top-dog coaches like Kyle Shanahan and Brian Schottenheimer. Not every coach has to be a QB coach to become an OC, but they almost definitely have to have been an OC or HC at the college level. That hurts some black candidates because the D-1 college ranks, a feeder system for offensive NFL assistants, has a pitifully low number of black head coaches as well. The tide has only slightly turned in the past decade, so most black coaches don't have the experience and years in the game to work up through the ranks. Many of the white OCs coached for over a decade before they got to the NFL. Some such as Sherman and Koetter began their careers many moons ago, at high school programs, and established credibility through years of grinding. A few brothers have been fortunate enough to benefit from solid relationships, progressive head coaches and rare opportunities. But, it’s hard for black coaches in general, to make up a 50-year head start in the coaching ranks by their white counterparts. 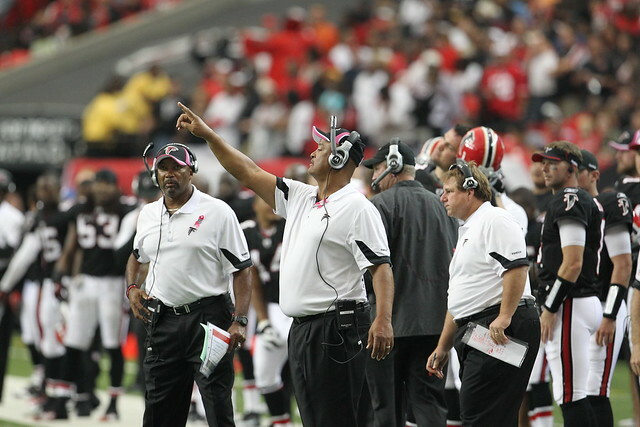 A black coach, however, can help their chances by developing close ties with a head coach. You almost have to be a teacher’s pet of sorts to get the special attention needed to actually be fast-tracked and developed into a trusted play-caller. Silver credits progressive minds like legendary 49ers head coach Bill Walsh with starting his minority-coaching fellowship program and for understanding that increasing the number of minority play-calling candidates means exposing them to the full duties of coordinator and head coaches. To become an OC, coaches require a deft grasp for calling plays, understanding formations and schemes, clock management, organization and an ability to make astute decisions under immense pressure. The only way an assistant coach can acquire those things is by learning under the direction of gifted and engaged mentors. A record 96 minority coaches – 43 of them former players — took part in the 2010 Bill Walsh NFL Minority Coaching Fellowship, and the numbers are steady rising. It’s been proven – with coaches such as Dennison, Tice and Musgrave – that qualified former players have an advantage up the coaching latter. Such a program prepares black assistant coaches and aspiring coaches to capitalize on that advantage. Pittsburgh head coach Mike Tomlin and ex-Bears head coach Lovie Smith were both a part of this program. Dennis Green, one of the first successful minority head coaches in the NFL, called plays as OC at Stanford in 1980 and then learned the intricacies of the West Coast offense and advanced play-calling as wide receivers coach for Walsh’s dominating 49ers teams from ‘86-‘88. Recently, Curtis Modkins rose to Bills OC because of his relationship with the recently fired Chan Gailey, which was nurtured through a Minority Coaching Fellowship in 1999. Modkins became Gailey’s shadow for the next decade. Hue Jackson is the current Bengals assistant secondary and special teams coach. Jackson was the beneficiary of coaches that saw his talent, and he was given play-calling opportunities as Steve Spurrier's OC with the Redskins in ’03, and as Falcons OC in ‘07. Jackson was eventually hired and further groomed by John Harbaugh as Ravens QB coach in ’08. Al Davis, a legendary pioneer in NFL race equity, tabbed Jackson for Oakland’s OC gig and ultimately its head position in 2010. Working with a coach known as an offensive guru can fast-track black assistant coaches. It can also stigmatize them as “puppet” coordinators. Modkins falls into that category, as his jobs have been under Gailey, a lauded offensive play-caller. Gailey calls most of the plays and Modkins nurtures the running game. Modkins has less of a chance of getting an OC job on a team where Gailey is not the coach. Clarence Shelmon, a veteran running backs coach, served as the San Diego Chargers' OC for the past five seasons. He recently retired, unable to advance, mostly due to the general belief that Norv Turner was the offensive mastermind and predominant play-caller for the squad. Redskins running backs coach Bobby Turner is next up to be an OC or even a head coach. He spent 15 years as Broncos running backs coach and has had success this season with Redskins rookie sensation Alfred Morris. While Turner’s history with Shanahan may allow him to understand the offense inside and out, Turner still hasn’t had the play calling experience. The heat has never been on him as The Man, and getting there as a Redskins assistant is going to be impossible with The Shanahan’s locking down the top spots. That shouldn’t stop Turner, though. The success of RG3 and the revamped Redskins backfield will bring him further out of the Shanahan shadows. It will just take some time and creativity. Many of these coordinators also coached running backs, receivers, lineman, special teams and even defense like Gilbride, before becoming play-callers. Becoming a QB coach is not the end all to becoming an OC. It’s the last stop before paradise and usually means you’re up next, but there are other paths to take. Some cats were already OCs at upper echelon colleges and just transitioned. Others began as interns and learned coaching through different career maneuvers. Being vocal and letting them know you want a shot, knocking it down when you get that chance and leaving no stone unturned in the quest are the keys to brothers not only making the plays but calling them.